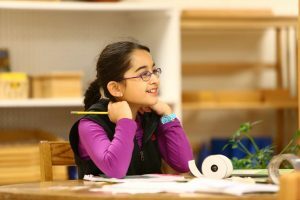 The Montessori elementary classroom builds upon the primary experience. As in primary, the elementary classroom’s materials are a means to an end. They are intended to evoke the imagination, to aid abstraction, to generate a world view about the human task and purpose. The elementary child works within a philosophical system asking questions about the origins of the universe, the nature of life, people and their differences, and so on. On a factual basis, interdisciplinary studies combine geological, biological, and anthropological sciences in the study of natural history and world ecology. Presentation of the formal scientific language of zoology, botany, anthropology, geography, geology, etc., exposing the child to accurate, organized information and respecting the child’s intelligence and interests. “Going out” to make use of community resources beyond the four walls of the classroom. The elementary program is made up of connective narratives known as “the Great Lessons.” The Great Lessons span the history of the universe, from the origin of the solar system, earth, and life forms to the emergence of human cultures and the rise of civilization. The child’s study of detail, put in chronology and context through reference to the Great Lessons, timelines and impressionistic charts, leads to awe and respect for the totality of knowledge. Studies are integrated, not only in terms of subject matter but in terms of moral learning as well. Through interaction with classmates, and guidance of the teacher, the Montessori elementary student develops appreciation and respect for life, social responsibility, respect for oneself and others, empathy, appreciation of the contribution of the individual, and a strong sense of justice.